I tryed to dissolve nickel plating on coin. So i put it to 40% sulfuric acid. Nothing happened. After that i heated acid in water path to 80 C and waited. Still nothing happened. Then i placed coin into 23% nitric acid. Nothing. 20% hydrochloric acid even when heated made only slightest bubbling and no remarkable harm to nikcel surface. So i put a drop of 85% sulfuric acid onto coin surface - nothing but when i heated the coin, just before decomposition of sulfuric acid reaction started and almost instantly nicel plating disapeared under drop of sulfuric acid. Is nickel trully so unreactive or maybe that plating was some especially inert alloy? Your thoughts? the Nitric acid test results is surprising, I would have thought of all the acids that would have worked. did you de-grease the coin 1`st? sometimes that can have quite an effect. I did not use organic solvents to de-grease coin but i scraped it to be sure at least some surface is completely clean. So they have added something to that Ni to make it more inert? I never have tried to dissolve pure Ni but various chromium nickel alloys i have got are easily soluble in those acids. perhaps it's an oxide layer? I know this is an old thread but this is relevant to the original problem so I'm posting. I dropped three five cent us coins (25% nickel 75% copper) into HCl. Copper can't replace hydrogen so contamination shouldn't be a concern. Nothing happened at all. I figured nickel must react with acids painfully slowly, so I added H2O2. The coins instantly turned ashy looking and began bubbling H2 slightly. After 10 minutes the solution was slightly green from nickel being oxidized. So, if you want to oxidize Ni just add hydrogen peroxide. It really speeds it up. Still pretty slow but in awhile you should have a decent amount of nickel in solution. hey, good call with the fenton's reagent. always puzzled me how H2O2 doesnt oxidize HCl. anyway, so now that you have aqueous NiCl2, what do you plan on doing with it? Initially I was just going to evap. the water/HCl (after allowing a fair amount of Ni to dissolve, probably let it do it's thing for a few days) and collect the NiCl2. I've heard it's a catalyst...this could be interesting. If anyone has any cool ideas for something to do with nickel chloride, feel free to post it. I could always toss some zinc in a soln. of nickel chloride and precipitate fine particles of nickel. Could be a good way to get superfine nickel powder. Ugh, I just found out that copper will be dissolved in the presence of oxidizing agents. Damn. if you do get pure nickel, you can use it as raney nickel in thioacetal elimination. 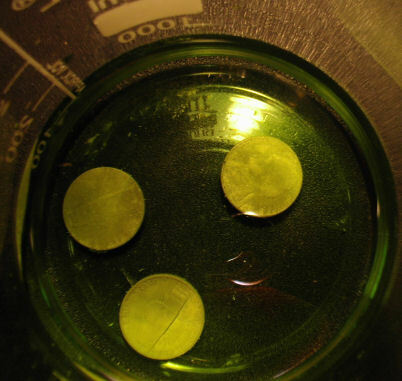 Nickel does dissolve in nitric acid, but the concentration must be carefully adjusted. I have made nickel nitrate from the Dutch coin 'dubbeltje', which is made of 99+ nickel metal (with mainly tin as an impurity). I found that in HNO3 (60%) the nickel did not dissolve, in 40% HNO3 it dissolves vigorously, in 20% HNO3 it did not dissolve. Quite an excess amount of HNO3 is needed in order to dissolve all metal, because at lower concentrations of HNO3, the metal does not dissolve anymore. Dissolving the metal can best be done by putting it in conc. HNO3 (60% or something like that) and dripping in water slowly and swirling. Making the acid luke-warm helps a lot. When the reaction starts, a LOT of brown NO2 is formed and the liquid becomes quite hot. Be careful and do this experiment outside or in a very good fumehood! Unfortunately, HNO3 is quite difficult to obtain. I read a post once on sciencemadness.org about someone trying to make nitric using microwave plasmoids and directing the nitrogen oxides into water. I'm assuming this is the same basic principle. Thats' strange, I can buy it at several places in concentrations up to 52% and I even was lucky to find some 58% HNO3. It is not as common as hydrochloric acid, but it certainly is not that hard to obtain (at quite some drugstores and also from chemical supply houses, who sell to private persons). Is it really so difficult to obtain chemicals in the USA? I sometimes order chems from the USA or Canada (only solids, no liquids like HNO3 of course ) taking the shipping costs for granted. I thought the USA is the walhalla for citizen chemists or has this changed due to 'war on drugs' and 'war on terrorists'? has anyone considered electrolysis in ordinary sulphuric acid? The liquid does not conduct electricity well, does it? actually it would conduct electricity very well. i would imagine that electrolysis in H2SO4 would work. good call, yt. i think the copper would oxidize, however. think i can get those dutch coins anywhere around here? Is nickel trully so unreactive or maybe that plating was some especially inert alloy? What about using nickel electrode as anode?